I found out I'd be styling these BDG blue ripped knee straight leg jeans from Urban Outfitters. Personally, these jeans aren't something I'd buy or even try on - they're a bit over the price I'd usually pay for jeans and the ripped knees aren't very 'me'. I prefer a plain old skinny jean in all honesty, I'm a bit of a plain Jane in that respect! But jeans are quite an easy thing to style, so I felt comfortable with the task. I took along several outfits to wear with the jeans; this ended up being a good thing actually as I was the last person to style them, so I needed to style it differently to the 4 other girls. Me and the stylists decided to go with my studded peplum top, faux leather jacket and flatforms as no one else had dressed the jeans up. I'd probably wear the outfit to go out for drinks (or something reasonably civilised like that). I had my hair done and the lovely Kerry White did my makeup - she used MAC's Ruby Woo on my lips if you were wondering what lipstick I've got on. Stephanie from Faiiint was there styling a different item - I've followed her blog for a while now and it's brilliant, so it was a privilege to meet her! Of course, I was nervous for the actual photo taking(s). I'm not a huge smiler, so putting on a cheesy grin was a bit of a challenge, but as you can see I managed it! The photographer gave me some direction luckily, so I don't look like too much of a plonker in the final image. I'm next to More! 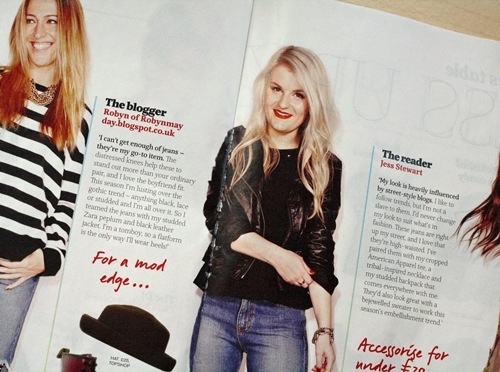 's fashion editor - how cool is that?! And the reader, Jess, on my right clearly has amazing style - that's why How Would You Wear has got to be my favourite feature in the mag, everyone has such different styles and it's really fascinating to see - I guess that's why I got into blogging! Just a quick correction on the text explaining my outfit to avoid any confusion - the top wasn't Zara unfortunately, but I wish it was! Also, it doesn't describe my style well - mostly my fault, describing your style on the spot is a little daunting! Some of what I said was lost in transcription (the copywriter took notes on what I said! ), but I do love black and my Docs as I'm sure you all know! 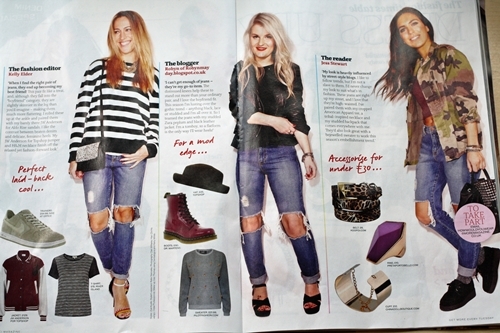 As far as I'm aware anyone can take part in this feature, so if you're interested email howwouldyouwear@moremagazine.co.uk. It was such an incredible experience and opportunity, I'm really honoured to have taken part in it! I've said it already, but you look awesome & you did an amazing job styling them, I'd have found them super tricky to style! Loved that your version was more dressed up too, tho maybe I'm biased because of all the black! Hah! Omg thats amazing :) you look gorgeous! Man, that's awesome! Well done you! oh my god well done you look gorgeous!!!!!! Congrats!!! I would be TERRIFIED to style jeans as I NEVER wear them due to my ample hips. You look INCREDIBLE!! You look great. The way you've styled them is a way I would love to wear those jeans! Congratulations on being in the magazine, you look really pretty !